Medicinal mushrooms have a restorative effect on humans and the land. Mushrooms have a profound ability to boost the immune system, fight cancers, and improve functioning of important organs. They also help to rehabilitate damaged and polluted environments. If used in a farm or permaculture system, the mushrooms can improve the health of the owner and the land. These five species of mushrooms help balance and heal the human body and the ecosystem. needed and inhibits overactive immune response. As a result, Reishi is extremely helpful with autoimmune disorders and reducing inflammation(2). It can also increase immune function, when there is a cold or virus. Reishi has been shown to have antidepressant and anxiolytic effect(3). The triterpenes lower blood pressure and cholesterol. The triterpenes have also shown activity against cancers, such as breast, leukemia, prostate, liver and lung cancers. of most desirable mushrooms. Reishi can be difficult to find in the wilderness. Fortunately, it can be cultivated at home on sawdust, wood chips, or logs. Comparatively little research has been done on Reishi’s mycorestoration properties. However, there is research confirming Reishi’s mycofiltration properties. Soils with mycelium, fungal networks, filter out or digest particles. Mycofiltration helps get rid of pollution from runoff water and other sources. Reishi(Ganoderma Lucidum) is known to digest or block the following pathogens: Aspergillus niger, Bacillus subtilis, Candida albicans, and Escherichia coli (5). The ganoderma species are also known to eliminate chemical dyes. The permaculture potential for mycofiltration are immense. Mycelium networks can be integrated into swales to filter out unwanted pathogens and chemicals. alcoholic tincture. The Inner orange layer contains beta glucans. These have an immunomodulatory effect similar to Reishi. These chemicals can be extracted via hot water. Double extraction is necessary to reap all the medicinal properties of the mushroom. Chaga can be growth on birch, beech, and oak by inoculating the logs with spawn plugs. Turkey Tail(Trametes Versicolor) apply named, resembles the patterned back feathers of a turkey. 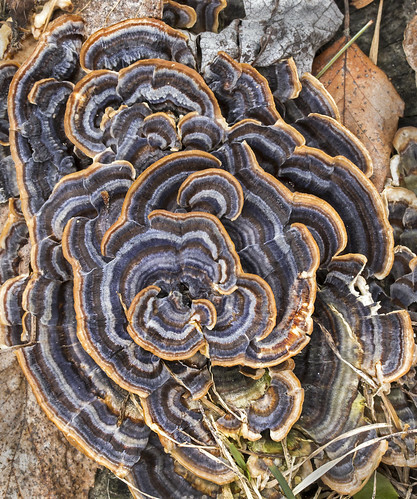 The colorful Turkey Tail is found growing on dead wood, often in great numbers. Turkey Tails can be eaten or prepared in a tea. When consumed turkey tail increases the body’s natural killer cells. These have been shown effective against cancerous cells. They are antiviral and found to be potent against HPV and Hepatitis C. It is effective against E Coli and Staph infection, too. Trametes Versicolor mycorestoration properties have been thoroughly researched. When used in mycofiltration, turkey tail is active against the following pathogens; Aspergillus niger, Candida albicans, Escherichia coli, Staphylococcus Aureus, and Streptococcus pneumoniae. It is able to decompose the following chemicals; Anthracenes(pesticides), Chromated Copper Arsenate(wood preservatives), Dimethyl phosphonate, dioxin (product of industrial waste), Persistent Organophosphates, Penta Chlorophenols (Pentas), Trinitrotoluene (TNT) (5). Turkey Tail is known to bioaccumulate mercury and remove it from the soil. chemical eritadenine lowers cholesterol levels. Shiitakes can have a very high concentration of vitamin D. Shiitake has antiviral and antibacterial properties. Studies show it is effective against herpes, Candida, Strep and Staph infections. When used in mycofiltration, Shiitake filters out the following pathogens:Candida albicans, Listeria monocytogenes, Mycobacterium tuberculosis,Staphylococcus aureus, Streptococcus pneumoniae, Streptococcus pyogenes. Shiitake is active against the following toxins; Polycyclic Aromatic Hydrogens(PAHs), Polychlorinated Biphenyls(PCBs), and Pentachlorophenols(PENTAs) (5). result with an energy deficiency. Cordyceps also increases oxygen availability which helps with highaltitude sickness and fatigue (8). Cordycep use leads to increased endurance. Cordyceps strengthens the lungs, kidneys, and liver. Cordyceps stabilizes blood sugar and increases insulin sensitivity. It is an immunosuppressant It is effective defensive against colon and breast cancer. Effective fighter against strep throat. Cordyceps is an effective mycopesticide. The mushroom can feed on insects and destroy entire populations of termites and ants (5). The mushroom infects an ant and hijacks it’s nervous system. It forces the ant to go the highest point in the area, then the mushroom extrudes from the ant and spreads its spores far and wide. Later, the spores infect other insects and the process continues. Cordyceps could be alternative solution to insect problems in the fields or on the homestead. 2. Shi, Min, Zhenya Zhang, and Yingnan Yang. “Antioxidant And Immunoregulatory Activity Of Ganoderma Lucidum Polysaccharide (GLP).” Carbohydrate Polymers 95.1 (2013): 200206. MEDLINE with Full Text . Web. 7 June 2015. 3. Matsuzaki, Hirokazu, et al. “Antidepressant Like Effects Of A WaterSoluble Extract From The Culture Medium Of Ganoderma Lucidum Mycelia In Rats.” BMC Complementary And Alternative Medicine 13. (2013): 370. MEDLINE with Full Text . Web. 7 June 2015. 4. Shi, Min, Zhenya Zhang, and Yingnan Yang. “Antioxidant and Immunoregulatory Activity of Ganoderma Lucidum Polysaccharide (GLP).” Carbohydrate Polymers 95.1 (2013): 20006. Web. 8 June 2015. 5. Stamets, Paul. Mycelium Running: How Mushrooms Can Help save the World . Berkeley, CA: Ten Speed, 2005. Print. 8. Holliday, John, and Matt Cleaver. “Medicinal Value of the Caterpillar Fungus Species of the Genus Cordyceps.” International Journal of Medicinal Mushrooms, 10(3):219–234 (2008) Medicinal Value of the Caterpillar Fungi Species of the Genus Cordyceps (Fr.) Link (Ascomycetes). A Review (n.d.): n. pag. Alohamedicinals . International Journal of Medicinal Mushrooms. Web. 9 June 2015.